PEGI Rating Label PlayStation 4 with Call of Duty: Advanced Warfare Day Zero and The Last of Us Remastered download. Pre order for release in 5 days. Good if you dont want the Fifa 15 and Minecraft bundle. any idea if it's a selected 5 games? Excellent, I was looking for a new grill. Is the new CoD gonna be any good though? Or just the same stale haddock they've been serving since 2007? Is the new CoD gonna be any good though? Or just the same stale haddock … Is the new CoD gonna be any good though? Or just the same stale haddock they've been serving since 2007? I would love for it to be good. Moved over to Bad Company/Battlefield a couple of years ago . Wish Asda would hurry up and release this so I can use my £40 voucher! Battlefield hardline looks brilliant compared to advanced warfare. But suppose each to their own. 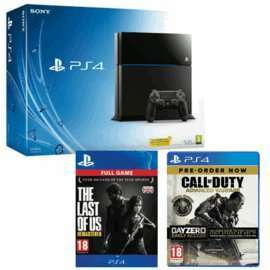 Would be good to have the evil within ontop of this package or a ps plus12 months membership and a white console. 2006 called, they want their joke back. Me three! No interest whatsoever in Fifa or Minecraft. Was always going to get TLOU and would give COD a play before deciding whether or not to keep it. Out of interest what is this £40 Asda voucher? How do you get it? It was an offer last week to register with your PayPal account. Spend over £200 at Asda, checkout with PayPal and you'll get £40 back into your PayPal account. because that's a reason to vote cold lol. So is it any 5 games u can trade in??? Yep the 11th, we've got ages yet. Hopefully they update first week in November with some decent deals. Still awaiting a tempting bundle with Assassin's Creed Unity. They don't give you anything extra for unopened games. Same for Game. Unless you're selling them on yourself to a mate or through ebay or the like, unopened doesn't count for much. i just noticed the last of us is a digital download not disk ! I think this one actually looks decent. Then again I think they've all looked decent from the trailer but after actually playing them they've been rubbish. I think the series has been going downhill since MW2. Hot, everyone with a PS3/PS4 should play TLOU at some point.